Guitarist and composer Erik Söderlind represents a new generation of young Swedish jazz musicians. He has studied at the Royal College of Music, and in 2010 Erik received Alice Bab’s Jazz grant and in 2015 he became the winner of the year of the Guitar People Prize. He regularly tours in Sweden and abroad and has played with Magnus Lindgren, Jojje Wadenius, Nils Landgren, Victoria Tolstoy, Barbara Hendricks, Frank Vignola and others. Musically, he is an innovator with tradition, and his unique style of playing and improvisational ability makes him one of the most charismatic and expressive Swedish jazz guitarists ever. In this program he is together with two other Swedish virtuosis on their instruments, Leo Lindberg – organ and Chris Montgomery – drums. 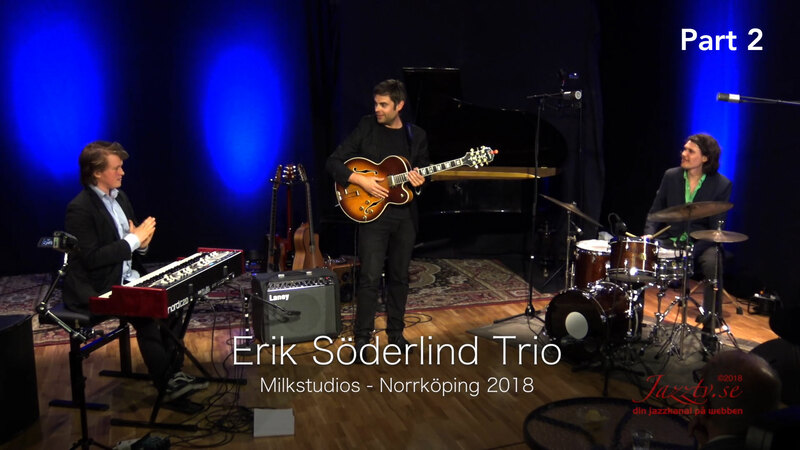 The concert is recorded in Milk Studios in Norrköping for www.jazztv.se 2018.